“If a piece of the building falls to the ground and breaks, they have insurance for that,” said a middle-aged man in a wheelchair in Houston. I sat in a small portable building behind a church, listening through an interpreter as the man, I’ll call him Miguel, told the story of how his spinal cord was injured when he fell on the job building homes along the Gulf Coast. “But, if I fall off a roof and I break, they don’t have insurance for me,” he said. I paused a moment before asking him any more questions, letting that sink in. The Living Hope Wheelchair Association in Houston was founded to help men with these injuries who have no workers’ compensation. They’re under-funded, barely getting by thanks to the donations of churchgoers and caregivers. A small group of volunteers help these men and women with their most basic needs. And they know how to stretch a dollar. With meager donations, they’re able to buy things like catheters and diapers the injured workers need on a daily basis. As one volunteer showed me their supply, which he was proud of, I couldn't help but feel sorry for them. These are the kinds of things people would rather not have to talk about even if they have to use them. What struck me hardest is the fact that these people are hidden. People don’t talk about them because they've been used and abused. “A democracy can’t survive very long when it throws away its workers,” the volunteer said with an almost revolutionary tone in his voice. Not only do these workers lack health insurance – in Texas, workers’ compensation is optional – they’re also not paid by the hour, don’t receive overtime pay, they lack safety training and of course they get no retirement plan. If you venture out to one of the many subdivisions being built just about anywhere in Texas, you’ll see row upon row of houses under construction. 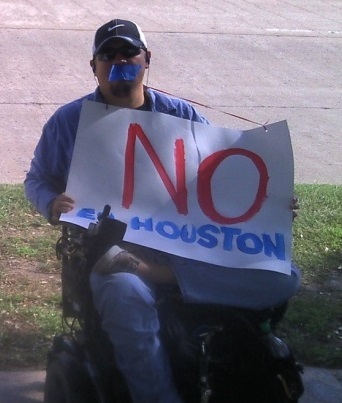 The workers, mainly Latinos, are one serious injury away from needing the volunteers of the Living Hope Wheelchair Association or other faith-based groups. They’re toiling in the hot Texas sun with no safety net. If they’re hurt, they’ll be patched up at the emergency room. Their employer will not get a bill. You and I will pick up the tab through our property taxes. Socialized medicine at its best, I suppose. How can any of this be legal? Many of these workers are undocumented. Unethical construction companies skirt the law and pay these people slave wages to do some of the hardest work there is: Roofing, carpentry, masonry, drywall hanging, and more. The way it’s done is actually pretty simple. You just make the worker his or her own boss. That’s right. Make them an “independent subcontractor” instead of an employee. Why bother with all the paperwork – and taxes – that go along with hiring an employee when you can just call him an independent subcontractor, give him a check with no taxes deducted and then give him a 1099 at the end of the year? Over the last year, I’ve dedicated almost all my time to the issue of misclassification in the construction industry. It still feels very new to me but it’s not new at all to the labor movement. The intentional misclassification of workers is also a growing concern for ethical industry leaders and an increasing number of conservative Republicans at the Texas Capitol. Worker misclassification, which labor leaders have for years called “payroll fraud,” happens when companies pretend the people working for them are independent subcontractors instead of employees. Put simply: When Miguel fell off that roof and ended up in the wheelchair, his employer was off the hook on multiple levels. Not only was he not covered by workers’ comp, he wasn't even classified as an employee. He was “his own boss”. He’s responsible for whatever happens to him. Many companies in the industry wash their hands of anything that happens. Not only is it terrible for the workers, but misclassification puts companies who play by the rules at a serious competitive disadvantage. Make no mistake: There are rules governing this abuse. It is already illegal to intentionally misclassify your workers. The problem, in Texas at least, is that there is no penalty for it. If a company is caught misclassifying workers, it must pay back taxes and sometimes overtime pay it would have owed anyway but there are no fines. Sort of like if you got a speeding ticket but you didn't owe anything for it. Enforcement on construction sites, especially in the residential sector, is almost non-existent. Those companies hire lobbyists to make certain this doesn't change. But, now they’re got a real fight on their hands. Late last year, a representative for the Texas Construction Association, Michael White, testified before the Texas Workforce Commission that companies cheating this way can underbid ethical contractors by as much as 25 percent. Cheaters get the contracts because they’re cheaper. This system also gives plausible deniability to the owners of the projects. They can say they simply don’t know the business practices of the companies doing construction work for them. The owners are only looking for the lowest possible cost. If a company pays its workers by the rules, doing so can make their bid as much as 25 percent higher. After White and several business owners testified that payroll fraud is “a cancer,” the members of the Workforce Commission voted unanimously to support penalties for companies engaging in this practice on government contracts. This was seen by many as a step in the right direction, but “it doesn't help us because it’s on every other job (other than government work) that they’re killing us,” said one construction executive who pays his workers as employees.” Stan Marek, President and CEO of the Marek Family of Companies, told commissioners the problem needs to be addressed through state and federal legislation. This outcry from the business community and the Workforce Commission’s unanimous vote grabbed the attention of the powerful chairman of the Texas Senate’s Business and Commerce Committee, Sen. John Carona. “Winners don’t cheat, and the cheaters’ day is over,” the Dallas Republican said. “I will be working with stakeholders, using what we've learned in many other states, to close the loopholes and restore fair competition to the construction industry.” To his great credit, he tried to do that. For months, Carona’s office held weekly meetings where business, labor, and others came together to talk about a fair way to address the problem. With the help of Texas Construction Association President Raymond Risk and others, an agreement was hammered out. The trick, Carona said, is to figure out who’s intentionally breaking the law, who’s just making a mistake because they don’t know any better, and who’s using independent subcontractors in a legitimate way. “There’s nothing simple about this,” Carona told me. “We’re facing headwinds,” he said. “Certain elements within the business community” would work hard to make sure this kind of legislation doesn't pass, he said. He was right. As Carona went about the business of crafting a solution, the press started to notice. I wrote about it in the Dallas Morning News, Fox News Channel told the story of ethical Texas construction company owners fighting against this “scourge” in their industry, and NPR ran a two-part series in which misclassification was called “a fundamental sickness.” From coast to coast, people were hearing about the fight against worker misclassification in Texas. At the capitol in Austin, lawmakers were also getting the message and talking about getting on board. But, as a longtime observer of the legislative process said: “Just wait to see who’s lying in the weeds.” It didn't take long for the opposition to become clear. In February, the word around the capitol was that the biggest home builders in Texas were quietly working against Carona’s efforts and had been from the very beginning of the 2013 legislative session. A memo was circulated behind the scenes that made several arguments against any crackdown on the already illegal activity. Among other things, the memo – no one claimed credit for being the author – said it wasn't fair for the construction industry to be singled out for this practice. In fairness to the anonymously made argument, there have also been complaints about workers being misclassified in fields as diverse as software engineering and modeling. Yes, it has been alleged that women who model clothes in New York have been illegally paid as independent subcontractors when, by law, they met the IRS definition of an employee whose payroll taxes should be paid by the employer. But neither software engineers nor runway models generally have a hard time putting food on the table or falling off roofs while working. Even though they at first kept quiet in their war against any effort to rein in misclassification, the fact that they were the ones arguing against it came to light when they testified against Carona’s language in a Texas House hearing. Perry Homes, DR Horton, and David Weekley Homes – the big boys – sent their lobbyists before lawmakers to make the case in public: Enforcement of the law in this area was unfair to builders and would make home prices rise for all Texans. The “Leading Builders of America,” the trade group for those builders, made the same points contained in that anonymous memo. Steve Henry with the group testified that putting new regulations in place would “price many Texans out of the market” for a home. Henry also said it would lead to more lawsuits, deter the creation of small businesses and stifle job creation. But, Henry was speaking against the legislation as it had originally been filed and he didn't seem to be aware of the revised version of the bill. The new version included a “safe harbor” provision for employers and allowed them to make the case to the state that their workers were indeed legitimate subcontractors. The new version, brokered by Sen. Carona during those months of meetings, allowed for employers to get their penalties reduced or zeroed out in some circumstances. “All it does is keep the intentional cheaters from cheating,” said John Hinson, Dallas Division President for Marek Brothers Construction. The changes satisfied the smaller home builders, who withdrew their opposition. The Texas Association of Builders, a different home builders group, was fine with it. “We worked with a bunch of industry groups and the Texas Association of Business," said Ned Muñoz with the association. One of their original worries, Muñoz said, was that the legislature was on track to create a new definition for who qualifies as a subcontractor. Business groups including the Texas Association of Business felt that if the state had its own definition, it would make things very confusing for employers. "Most parties had that concern," Muñoz said. Committee Chairman John Davis, R-Houston, challenged the large home builders on why they were unable to hire workers and pay them as employees. When builders argued that it’s common practice to hire someone, pay them for two weeks or so, then move on to the next project, Davis suggested they simply hire those people, move them from project to project and work them as employees. To that, homebuilders argued that each home is its own project and their business model would be harmed if they had to change it. Andrew Turner, also representing the largest home builders, testified before the committee that the proposal would be a "confusion of an already confusing area of the law." Turner argued that if the legislation became law, more people would have to be paid as employees instead of independent subcontractors. From a cost standpoint, that means that construction companies not already complying with the law would be on the hook for payroll taxes. “Whenever costs go up for a builder that has to be passed along somewhere,” Turner said. Since it was clear Mr. Turner and Mr. Henry were not speaking about the latest version of the bill, I went the extra mile to be fair to them and their group. A few days later, I called Steve Henry at his office in Dallas. We talked about the fact that he had not been aware of the latest version of the legislation. Henry said he still had not had a chance to review the latest version. I asked if he’d like to visit with me after looking at it. For good measure, I obtained a copy and emailed it to him. My emails and calls for a follow-up conversation were never answered. It seemed clear the opposition from the largest Texas home builders wasn’t contingent on details. They were against it in general. A few days after that, the House committee voted unanimously to approve the proposal and send it to the House floor for debate. But, there’s one more stop before a bill can make it to the House floor. A committee with an innocuous sounding name wields tremendous power and can make or break legislation. The House Calendars Committee does just what its name would suggest: It decides what the schedule of the House of Representatives will be to consider specific bills. In performing this function, the members of the committee can also opt to not assign a day for a bill to be heard. So, even if something is unanimously agreed to by Republicans and Democrats alike in a committee, as Carona’s misclassification crackdown language was, it can still die before ever getting to the House floor. And that’s what happened. Even though nearly all the testimony – from labor and construction leaders alike – was positive, the worker misclassification bill died a silent death in the House Calendars Committee. Labor leaders have worked on this issue for years and felt like they've never gotten traction at the capitol. “We felt like we were wolves crying out in the wilderness,” said Rick Levy with the Texas AFL-CIO. “But, this session felt different. Big swaths of the business community and Republican chairmen in the legislature were interested in solving this issue that’s really a problem for everyone,” he said. Levy and others pointed to the exchange between Rep. Davis and the home builders, in which the GOP chairman of a business committee was openly challenging them. “That never would have happened before,” Levy said.